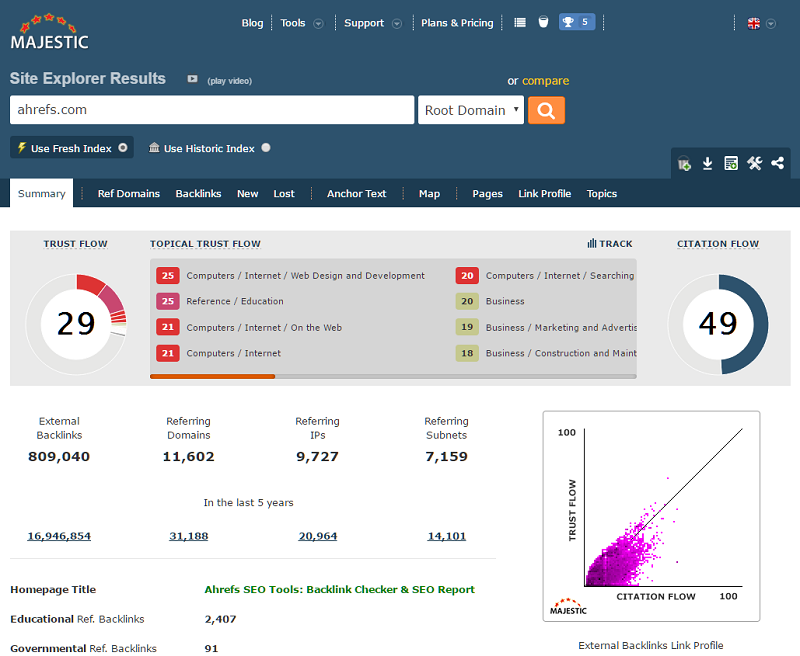 Majestic vs Ahrefs - Which is the best backlink checker tool? If you are under the impression that every website on the Internet is an independent entity which does not have any relationship with other websites sharing the same space, you could not have been more wrong. Every website is like a unit which is linked to other similar units of varying sizes and together they form an interwoven fabric which is known as the Internet. So is it possible to derive detailed information about this fabric? Yes, it is and this is where Majestic comes into the picture. Among the available SEO tools, very few are versatile enough to suit different segments ansd Majestic is one of them. It can be used by SEO professionals to perform functions like managing portfolio, auditing websites, identifying potential clients and making success reports. Media analysts use this tool to figure out the presence of various elements and understand their relationships. Majestic is truly helpful for entrepreneurs because it enables them to identify new business opportunities and keep track of various ad, media and SEO campaigns and developers value Majestic owing to its ability to generate accurate and comprehensive data. Site explorer - Having registered with the site and logged in, you will be provided with a glimpse of the Home page of the website accompanied by its SEO summary. Because other pages under the same website are also covered, you can go through each of them and accordingly chalk out your own SEO campaign. History of backlinks - Thanks to this tool, you will be able to check backlinks in terms of number and quality that may have been provided on the particular domain, url or subdomain. If you are a registered user, this tool will enable you to simultaneously compare backlinks across 5 domains and in this way get the better of the competition. Search explorer - To find where exactly the keyword or keyword phrase has been used, the search explorer of majestic is your best bet. Not only will you be able to find out where the keyword is positioned but also the number of times that it has been used on the page as also through the entire url. Intel gathering - This is a relatively technical aspect of Majestic wherein all the data which has been stored on the link intelligence map can be retrieved as per your requirement. There are several licensing levels in this regard and all you need to do is to subscribe for a plan which appears to suit your level of intel gathering. 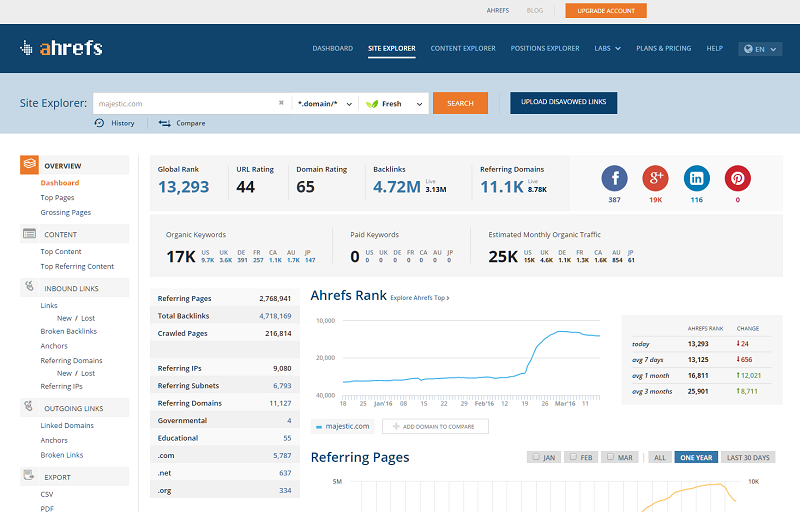 In terms of functionality, Ahrefs is one of the few SEO tools that are labeled as being complete courtesy of including features like site explorer, research tools for checking competitive links and comparing domains. Under site explorer, you can enter a specific page of a given url or gain access to the entire domain in order to gather information that would help you with your online marketing planning. Having gained access, you will be privy to information like IP addresses and referring domains, domain extensions which are linked to the page or the website, quality of backlinks, charts and easy-to-read bar graphs. Further exploration would lead to checking of external links, their export as also breakdown of text used in anchor tags. When you compare domains, results that are generated pertain to backlink reports and analysis of multiple domains. The tool also facilitates comparison of five domain names in terms of types and their backlinks. Combining data - The fact that Ahrefs is able to combine all the data on the Internet so that a single access point is sufficient to look after multiple requirements is the biggest plus point of this tool. An added advantage accrues from the fact that data is updated once in 30 minutes, thus implying that whatever is visible on the screen is fresh and recent. You can also discover new links and use these to replace old links which might have broken or lost significance over a period of time. Ahrefs makes an attempt to fix lost links and unlike other tools, it generates it own unique index. In-depth information - Did you know that it is possible to break down anchor text into phrases and terms wherein you can segregate actual phrases from one-word, two-word, three-word and four-word terms? In this way, you will be able to check whether there are any issues of overdoing optimization and if the phrase has been appropriate for your content and website. Unique social metrics - It is on Ahrefs that you will be able to find social media links of all urls' and a breakdown of domain name extensions, particularly for external links. Based on my personal research of around 30-40 domains, I find that Majestic shows more back links than Ahrefs. Although this sample size is too small for a 100% certainty, since there is no other reliable source of data on this, I will go with my data and gut feel and recomment a Majestic subscription over Ahrefs.